What I used to do, before I wrote patterns, was to just start playing around with what I had at hand and work something up. It was fun, everything I made was one-of-a-kind, and I would get asked often if I could a) make another one or b) write up a pattern. I would rather write up a pattern, and so for the past few years I have taken copious notes and started working out plans before I get started, and make revisions, and oh, I am tired of that right now. I decided it was time to get back to the part that was the most fun for me, and that's how I spent my knitting and crocheting time this weekend. There are no patterns for these and I don't plan to write any up. 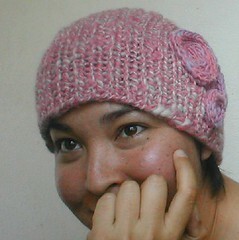 Rib knit hat with rosettes: all yarn is Lime & Violet handdyed/handspun 100% wool. The fit is soft and loose med/lg. I'm listing this for sale in my Etsy shop, with 50% of the sale price going to the current Lime & Violet fundraiser (as of 12/14 this is on hold pending payment). The fit is soft and loose, coming down to the eyebrows on a med/lg adult head. Neckwarmer, also made with Lime & Violet handdyed/handspun 100% wool and SWTC Karaoke (soysilk/wool blend) and a smidge of Cascade 220 for the leaf decoration. 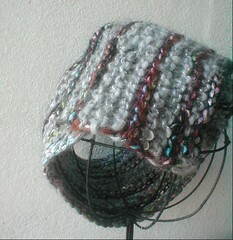 The three smaller rosettes are also buttons to secure the neckwarmer, with the largest being decoration only. Sized to fit med/lg adult. This went up in the Etsy shop and sold almost immediately - if I have the inclination (we all know I certainly have enough yarn) I'll make more based on the same recipe. 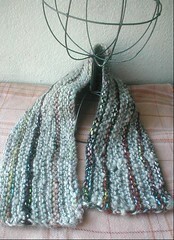 Another neckwarmer, this one made with Terra Bella Spun handspun yarn (the "Sparkling Silver" that I purchased recently), and Noro Gemstones. 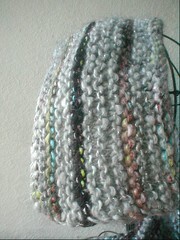 I got a skein of the Gemstones in a swap and have been reluctant to part with it, although also unsure of how to use it. Look Michelle! I used it! This one still needs buttons. I really like the ways the colors are working and the subtle shine and sparkle, but I don't know that I'd use this much. I might gift it or sell it, we'll see.